Picture - Curtiss A-3 Falcon (S/N 27-243). This was the first A-3 aircraft and later converted to O-1B. The type was introduced in 1925 and saw first-line service in the United States until 1934. Curtiss Falcons fought in the Constitutional Revolution of 1932 in Brazil, used by the forces of Sx�o Paulo. The U.S. Navy introduced the F8C-1 and F8C-3 Falcon as a shipboard fighter in 1927-1928. They were later redesignated OC-1 and OC-2 for Marine Corps use as an observation/bomber. The F8C-4 Helldiver variant initially saw service with the Navy, and the first production batch of 25 was transferred in 1931 to the Marine Corps. 34 F8Cs redesignated as O2C-1 observation aircraft were also transferred to the Naval Reserve in 1931, serving with squadrons VN-10RD9, VN-11RD9, and VN-12RD9. Most of the 63 newer F8C-5/O2C-1 Helldivers also served with the Marines, remaining in service until 1936. The type was featured in two Hollywood films, Hell Divers and King Kong. Curtiss Falcon aircraft fought during the Brazil Revolution of 1930, under the flag of Sx�o Paulo. In Bolivia the aircraft type also fought in the Chaco War (1932-1935), bombing Paraguayan troopers. The Colombian Air Force used Falcon F-8 and O-1 in the Colombia-Peru War in 1932-3. Model 44, attack aircraft version of O-1B, armed with two 0.30 in (7.62 mm) machine guns and 200 lb (91 kg) of bombs. 76 built for the USAAC, including 20 diverted from original O-1B contract order. 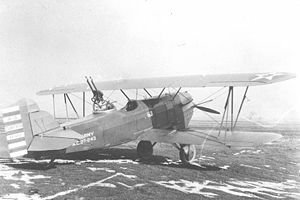 Model 37H, attack version of O-1E, with six machine guns, including two mounted in wings. 78 built. One A-3 with a Pratt &amp; Whitney R-1340-1 Wasp radial piston engine. Scrapped in March 1932, but the design was the basis for the naval variants. Model 37B, first major production version, powered by Curtiss D-12D (V-1150-3) engine. 45 ordered, 25 built and 20 diverted on the production line to the A-3. Model 37I, variant powered by 324 kW (435-hp) Curtiss D-12E (V-1150-5) piston engine, 41 built. Model 38, final O-1 variant, powered by a 712 hp (531 kW) Wright R-1820F-2 Cyclone engine. 30 built for USAAC. O-1 airframe powered by the Liberty V-1650 piston engine, 67 built concurrently with the O-1s. O-1G refitted with a Conqueror engine and cockpit canopy, ten built. Model 37C variant developed from XO-12. Two built for the U.S. Navy. Model 37C powered by the 420 hp (313 kW) Pratt &amp; Whitney R-1340 Wasp radial piston engine. Four built in 1928 for the U.S. Marine Corps as light bombers, fighters and observation aircraft, later redesignated OC-1. Second production batch of Navy Falcons. 21 built for USN/USMC in 1928, later redesignated OC-2. Model 49B, production dive-bomber variant for the USN/USMC. 25 built, later designated O2C. Model 49B with ring cowling. 63 built in 1930-31, later designated O2C-1. Redesignation of F8C-5. 30 additional built as O2C-1s in 1931. 20 civil versions: Conqueror Mail plane; D-12 Mailplane; Lindbergh Special, sold to Charles Lindbergh; Liberty Mailplane, 14 single-seat mailplanes, powered by a Liberty piston engines, sold to National Air Transport. ;Export Falcon: 16 twin-float O-1Bs sold to Colombia. One seaplane version of the O-1B was sold to Columbia, followed by an order for fifteen more. Another ten Model 35F were sold to Peru. O-1E design built under license in Chile, ten later sold to Brazil. One example ended up in Paraguay as passage fee for the remaining planes. It operated mostly as a VIP transport, but made at last one reconnaissance flight over the Chaco war fields armed with 2 7.7mm MG from a Potez. Similar to Colombian Falcon, it was fitted with the 712 hp (531 kW) Wright Cyclone SR-1820F-2 radial piston engine. A total of 9 were built for Bolivia in some odd variants from the Colombian ones: Bolivian Cyclone Falcones mounted one frontal .30MG and most also one rear .30MG instead of the 2 wing mounted ones. 2 has peculiar half-cockpit canopies over pilots cockpit; 2 had windscreens instead of canopy in both cockpits, these 2 had no ring mount for rear MG. Guns: 4 x� forward-firing .30 in (7.62 mm) Browning machine guns and 2 x flexible 0.30 in (7.62 mm) Lewis machine guns on a Scarff ring.